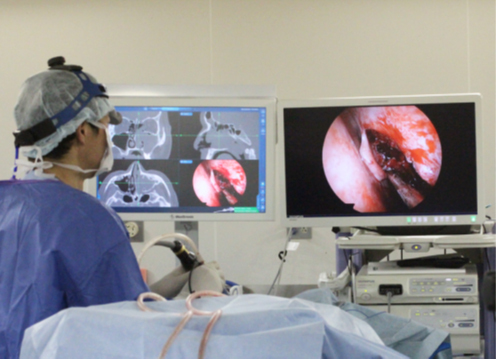 The Department of Otolaryngology–Head and Neck Surgery at Hokuto Hospital was established in 2007. 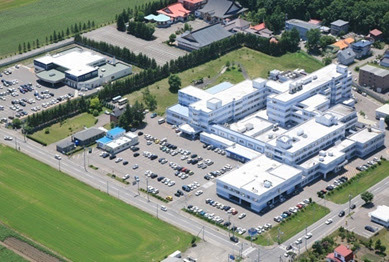 As the core hospital in eastern Hokkaido, Japan We provide high-quality care to patients with diseases affecting the ear, nose, throat, and head and neck areas. More than 15,000 people visit our department, and 750 patients are hospitalized each year. Surgery was performed on 450 patients, including tympanoplasty, endoscopic sinus surgery, laryngomicrosurgery, neck dissection and thyroidectomy, etc. For treating head and neck cancer, we combine surgery with chemoradiotherapy. We aim to perfectly cure our patients and to preserve speech and swallowing functions in them. We collaborate with regional clinics, other hospitals and health care professionals to develop a team-based approach to medicine. Every member of the stuff takes pride in striving to provide the best leading-edge medical care to all patients. Allergic rhinitis is a type of allergy that affects the greatest number of people. It is estimated that from 10 to 30% of people in Japan are affected. Allergic rhinitis, also known as hay fever, is a type of inflammation in the nose which occurs when the immune system overreacts to allergens in the air. Signs and symptoms include a runny or stuffy nose; sneezing; red, itchy, and watery eyes; and swelling around the eyes. The fluid from the nose is usually clear. Symptom onset is often within minutes following exposure. The symptoms can affect sleep, the ability to work, and the ability to concentrate at school. Those whose symptoms are due to pollen typically develop symptoms during specific times of the year. Some people with allergic rhinitis also have asthma, allergic conjunctivitis, or atopic dermatitis. In the Hokkaido area, birch pollen allergy is identified as the cause in 50% of all allergy patients, and 30% of patients allergic to birch pollen have oral and pharyngeal hypersensitivity to fruit such as apples. This is called an oral allergy syndrome (OAS) or pollen food allergy syndrome (PFAS). We perform Argon plasma coagulation (APC) for allergic rhinitis patients with severe nasal obstruction under local anesthesia. We conduct more than 80 endoscopic sinus surgery (ESS) under general anesthesia each year. We routinely use endoscopy (VISERA Pro, Olympus), microdebridder system and endscrub (IPC ENT system, Medtronic) and Hydrodebridder irrigation System (Medtronic). Electromagnetic tracking navigation system (StealthStation S7, Medtronic) is also equipped. We can perform ESS safely, rapidly and easily by using these newly developed instruments,. We treat a lot of patients with upper respiratory tract infectious disease including acute pharyngotonsillitis, peritonsillar abscess, acute epiglotitis and deep neck abscess. We assess the severity of acute pharyngotonsillitis with scoring system. We administer intravenous injection of penicillin (Ampicillin/ Sulbactam) to the patients with upper respiratory tract infectious disease. We incise and drain to the patients with the abscess. 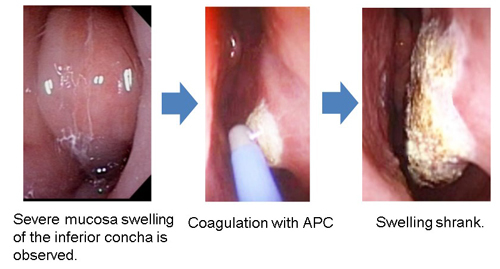 We conduct Quinsy tonsillectomy for the treatment of inferior type of peritonsillar abscess. 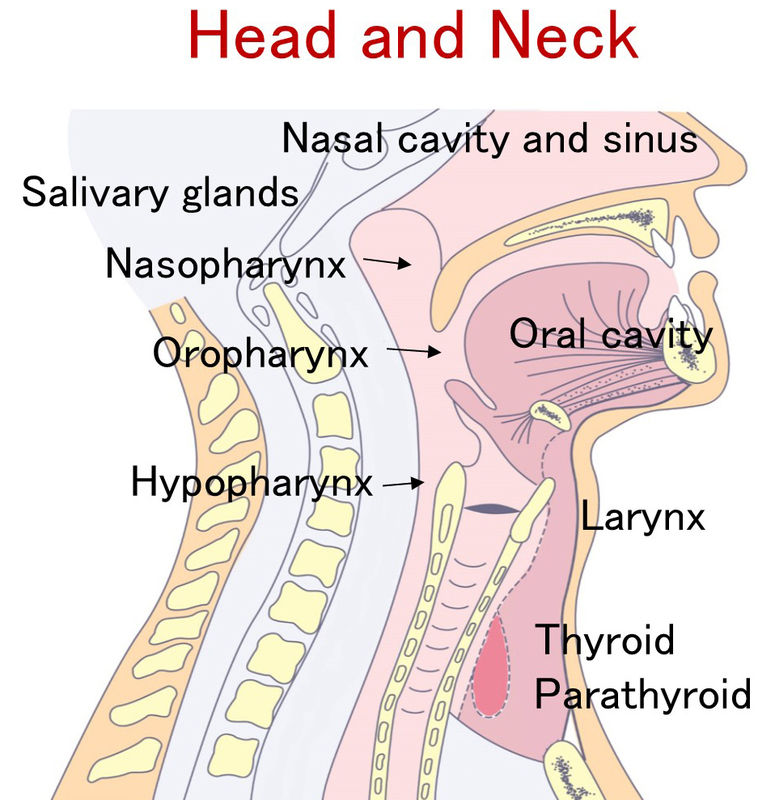 A swallowing disorder is usually caused by a central nervous system disorder such as cerebral infarction and hemorrhage, neuromascular disease, or as a side effect of surgery for head and neck cancer. This condition is more common in older people. We routinely evaluate the degree of swallowing disorder by using videofluorography (VF) and videoendoscopy (VE). Speech-language-hearing therapists (ST) teach patients to perform and practice many exercises to improve swallowing during their dysphagia rehabilitation. 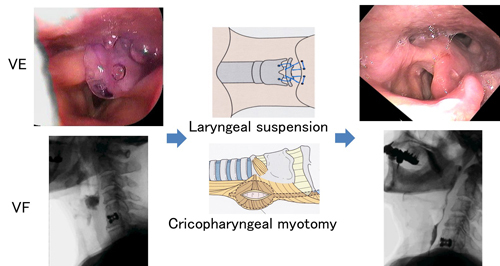 To improve swallowing function in patients with brain stem infarction such as Wallenberg syndrome, we perform surgery called cricopharyngeal myotomy and laryngeal suspension. Surgery to prevent aspiration, including laryngotracheal separation and total laryngectomy, is indicated for the patients with severe repeated aspiration pneumonia. OSAS is the most common type of sleep apnea; it is caused by complete or partial obstruction of the upper airway. This condition is characterized by repetitive episodes of shallow or paused breathing during sleep, despite the effort to breathe, and is usually associated with a reduction in blood oxygen saturation. Severity of OSAS measured by the apnea hypopnea index (AHI) is assessed with the apnomonitor and/or polysomnography (PSG). Patients with an AHI greater than 40 are advised to use nasal-continuous positive airway pressure (CPAP). More than 100 patients use nasal-CPAP in our outpatient clinic; most of them sleep well. We recommend uvulopalatopharyngoplasty (UPPP) for patients with tonsillar hypertrophy. Chronic otitis media results from a perforation in the eardrum and an active bacterial infection within the middle ear space that has lasted for several weeks or more. There may be enough pus present that it drains to the outside of the ear (otorrhea). Hearing impairment often accompanies this disease. Cholesteatoma involves a destructive and expanding growth consisting of keratinizing squamous epithelium in the middle ear and/or mastoid process. Although cholesteatomas are not classified as either tumors or cancers, they can still cause significant problems because of their erosive and expansive properties. They may result in the destruction of bones in the middle ear, which requires surgery. They may, as well, spread through the base of the skull into the brain. Tympanoplasty is the surgical operation performed for the reconstruction of the eardrum and/or the small bones of the middle ear after removal of granulation and/or cholesteatoma. Common graft sites include the temporalis fascia. We perform more than 20 operations in patients with chronic otitis media and cholesteatoma each year. Canal wall down tympanoplasty with reconstruction of soft posterior meatal wall is usually our method for treating cholesteatoma. 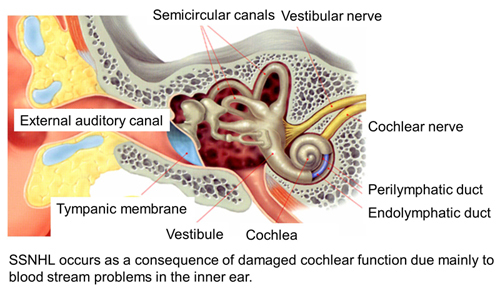 The insertion of an ear tube reduces the occurrence of middle ear infections and allows the drainage of excess fluids. The most common indication for insertion of an ear tube remains recurrent acute otitis media (AOM) in children and persistent otitis media with effusion (OME) with conductive hearing loss. We insert ear tubes into more than 50 children each year under general anesthesia. Facial nerve paralysis is one of the diseases that commonly lead to the loss of facial expression. We treat more than 70 patients with facial nerve paralysis, including 80% with Bell’s palsy and 20% with Ramsay-Hunt syndrome each year. Patients with severe facial nerve paralysis are hospitalized and treated with intravenous prednisolone tapering from 120mg, low-molecular dextran, vitamin B12, ATP and glycerin. Speech-language-hearing therapists (ST) perform rehabilitation of facial muscles in these patients. We assess the possibility of the mitigation of facial nerve paralysis by electroneurography (ENoG). 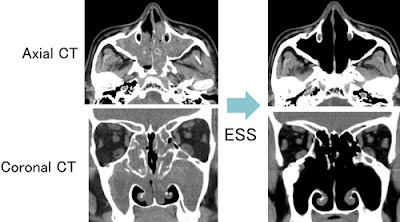 Patients with severe facial nerve paralysis who do not improve with steroidal therapy and ENoG < 10% are considered for facial nerve decompression. We inject botulinum toxin (Botox®) to the ocular and zygomatic muscle to improve pathologically associated movement. Sudden sensorineural hearing loss (SSHL), commonly known as sudden deafness, occurs as an unexplained, rapid loss of hearing –usually in one ear– either suddenly or over several days. We treat more than 80 patients with this disease each year. Patients with severe hearing loss are hospitalized and treated with intravenous prednisolone tapering from 120mg, low-molecular dextran, Vitamin B12, ATP and glycerin. Hyperbaric oxygen (HBO) therapy is also used for our patients. 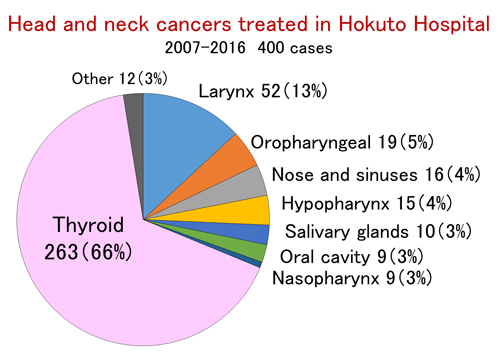 Head and neck cancer team at Hokuto Hospital includes not just head and neck surgeons, but it also includes radiologists, oral surgeons, dentists, and plastic surgeons. Others in many subspecialties—neurosurgeons, ophthalmologists, doctors practicing palliative medicine, pathologists, anesthesiologists, pharmacists, speech therapists and experienced head and neck cancer nurses—work closely with our core team to deliver comprehensive and personalized care to our patients with head and neck cancer. We can provide microvascular reconstruction using a free flap for surgical defects after removal of head and neck cancers. 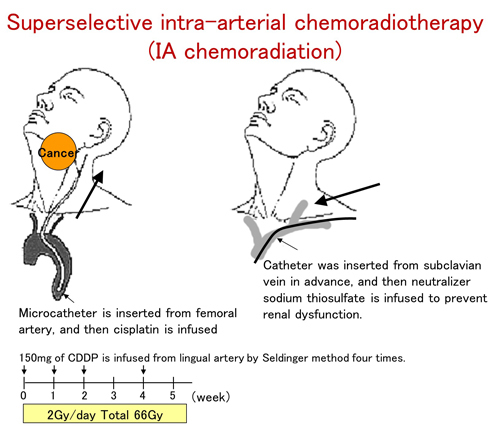 We can also take a proactive stance for chemotherapy with anticancer drugs including molecular target drugs and image-guided, intensity-modulated radiation therapy (IG-IMRT). Patients diagnosed with head and neck cancer face unique challenges that can greatly affect quality of life. Unlike other malignancies, head and neck cancer has the potential to significantly affect a patient’s appearance, speech, swallowing, and other senses. We proactively work to optimize each patient’s quality of life and provide the best treatments for preservation of speech, taste and swallowing functions, as well as maintaining overall physical appearance. 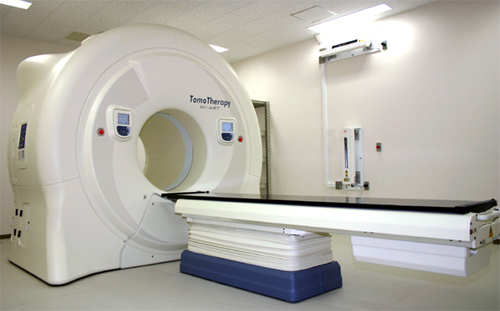 TomoTherapy combines the use of CT scans with a radiation treatment device. It is an advanced system that delivers image-guided, intensity-modulated radiation therapy (IG-IMRT). 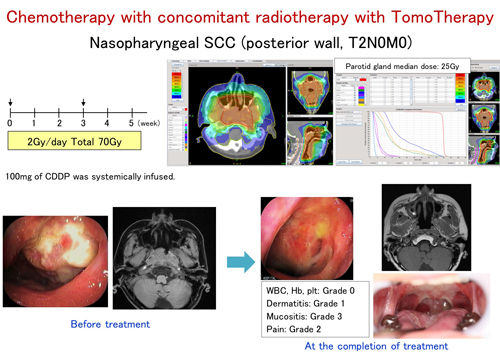 TomoTherapy for radiation treatment is extremely precise and advantageous as it delivers sufficiently low exposure to organs at risk, such as the salivary glands, brain stem, spinal cord, and optic pathway. 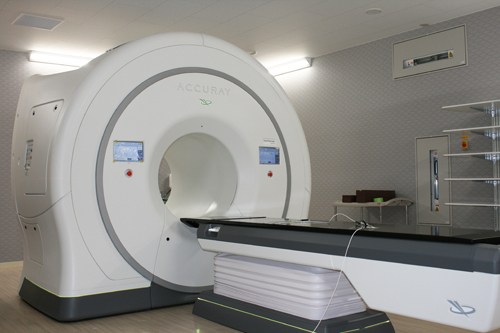 It uses daily CT imaging to guide the radiation field. A typical course of radiation therapy involves a daily visit from the patient to the hospital on Monday through Friday. The full daily TomoTherapy procedure takes 10 to 20 minutes for the patients. We installed and begun using TomoTherapy in 2005 and were the first TomoTherapy users in the Asia-Oceania area. 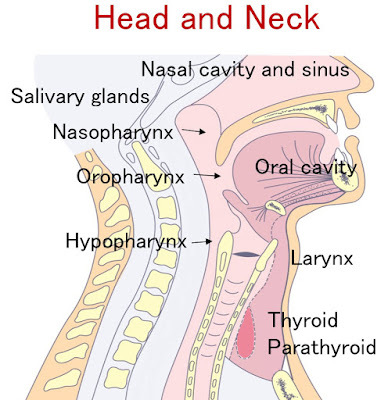 The thyroid gland is located in the front of the neck just below the larynx. 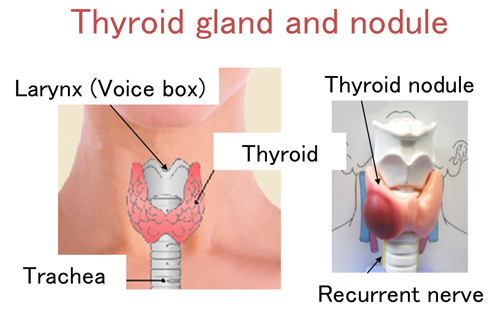 The thyroid gland is one of the endocrine organs; it absorbs iodine from the bloodstream and produces thyroid hormones. 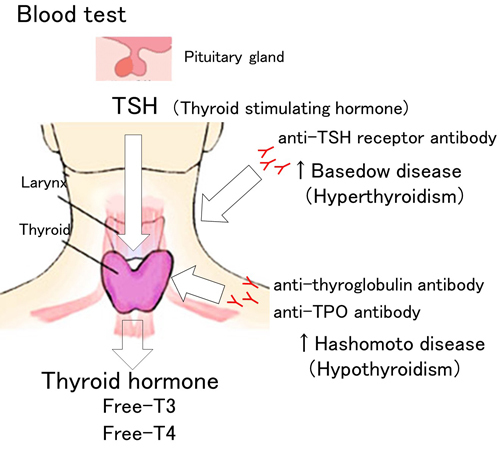 Thyroid hormones regulate a person’s metabolism. 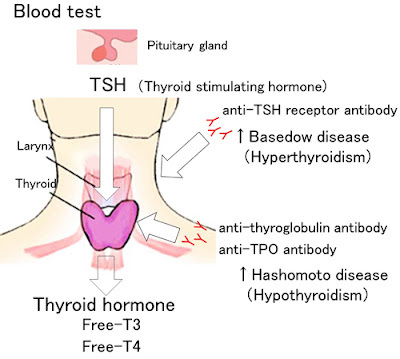 A normal thyroid gland appears butterfly-shaped and has a weight of 10 g–15 g. A healthy thyroid gland is not palpable. If a tumor develops in the thyroid, it is felt as a lump in the neck. 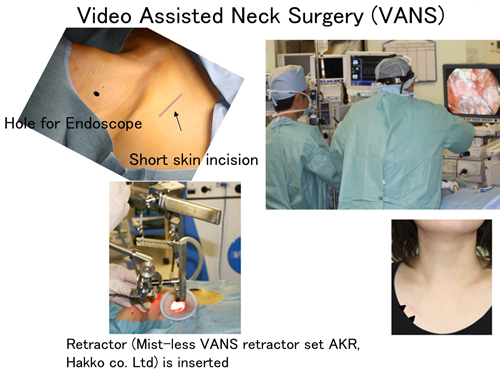 VANS is a new surgical procedure for thyroid surgery, which was developed by Professor Kazuo Shimizu in 1998. Conventional thyroid surgery requires more than a 6-cm long incision in the anterior neck. As thyroid diseases are particularly common in women, the scar left in the skin can be a cosmetic problem. 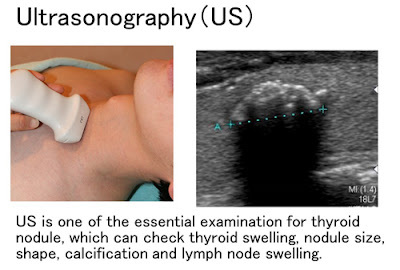 We introduced endoscopic thyroid surgery (VANS) in 2009. Using this procedure, just a 3-cm skin incision is made in the lateral chest wall below the clavicle. 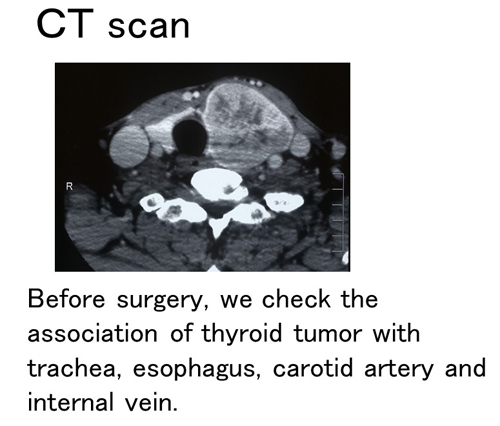 So far, we have applied VANS methods for patients with mainly benign tumors. 4) Bandoh N, Yoshizaki T, Ishida Y, Goto T, Takahara M, Hayashi T, Harabuchi Y, Kumai M,Yamanaka N: Evalution of the clinical efficacy of antibiotics using a scoring system for acute pharyngo-tonsillitis. Adv. Otolaryngol ,72: 212, 2011. 5) Bandoh N, Ogino T, Katayama A, Takahara M, Katada A, Hayashi T, Harabuchi Y: HLA class I antigen and transporter associated with antigen processing downregulation in metastatic lesions of head and neck squamous cell carcinoma as a marker of poor prognosis. Oncol Rep, 23: 933-939, 2010. 6) Goto T, Bandoh N, Nagato T, Takahara M, Harabuchi Y, Tokusashi Y, Miyokawa N: Primary small cell carcinoma of lacrimal sac: case report and literature review. J Laryngol Otol, 124: 1223-1226, 2010. 7) Ota R, Katada A, Bandoh N, Takahara M, Kishibe K, Hayashi T, Harabuchi Y: A case of invasive paranasal aspergillosis that developed from a non-invasive form during 5-year follow-up. Auris Nasus Larynx, 37(2): 250-4, 2010. 8) Yoshizaki T, Bandoh N, Ueda S, Nozawa H, Goto T, Kishibe K, Takahara M, Harabuchi Y: Up-regulation of CC chemokine receptor 6 on tonsillar T cells and its induction by in vitro stimulation with alpha-streptococci in patients with pustulosis palmaris et plantaris. Clin Exp Immunol, 157: 71-82, 2009. 9) Goto T, Bandoh N, Yoshizaki T, Nozawa H, Takahara M, Ueda S, Hayashi T, Harabuchi Y: Increase in B-cell-activation factor (BAFF) and IFN-gamma productions by tonsillar mononuclear cells stimulated with deoxycytidyl-deoxyguanosine oligodeoxynucleotides (CpG-ODN) in patients with IgA nephropathy. Clin Immunol, 126: 260-269, 2008. 10) Chang CC, Ogino T, Mullins DW, Oliver JL, Yamshchikov GV, Bandoh N, Slingluff CL, Jr., Ferrone S: Defective human leukocyte antigen class I-associated antigen presentation caused by a novel beta2-microglobulin loss-of-function in melanoma cells. J Biol Chem, 281: 18763-18773, 2006. 11) Bandoh N, Hayashi T, Takahara M, Kishibe K, Ogino T, Katayama A, Imada M, Nonaka S, Harabuchi Y: Loss of p21 expression is associated with p53 mutations and increased cell proliferation and p27 expression is associated with apoptosis in maxillary sinus squamous cell carcinoma. Acta Otolaryngol, 125: 779-785, 2005. 12) Bandoh N, Ogino T, Cho HS, Hur SY, Shen J, Wang X, Kato S, Miyokawa N, Harabuchi Y, Ferrone S: Development and characterization of human constitutive proteasome and immunoproteasome subunit-specific monoclonal antibodies. Tissue Antigens, 66: 185-194, 2005. 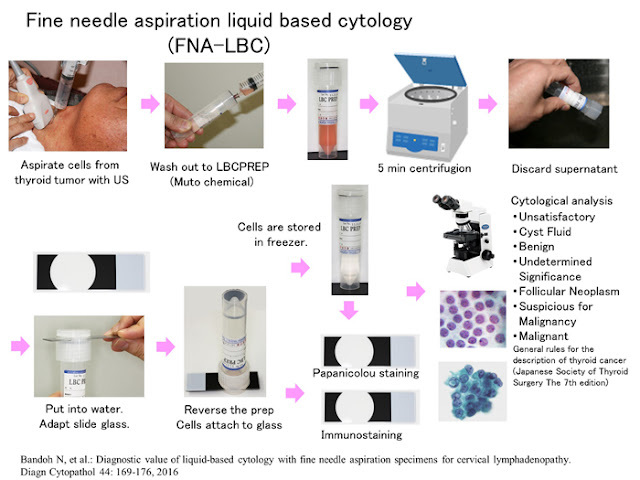 13) Wang X, Campoli M, Cho HS, Ogino T, Bandoh N, Shen J, Hur SY, Kageshita T, Ferrone S: A method to generate antigen-specific mAb capable of staining formalin-fixed, paraffin-embedded tissue sections. J Immunol Methods, 299: 139-151, 2005. 14) Bandoh N, Hayashi T, Takahara M, Kishibe K, Ogino T, Katayama A, Imada M, Nonaka S, Harabuchi Y: VEGF and bFGF expression and microvessel density of maxillary sinus squamous cell carcinoma in relation to p53 status, spontaneous apoptosis and prognosis. Cancer Lett, 208: 215-225, 2004. 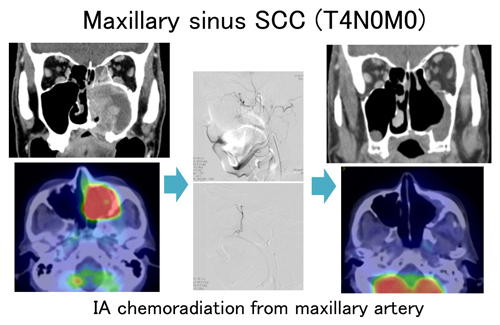 15) Bandoh N, Ogino T, Hayashi T, Nonaka S, Harabuchi Y, Miyokawa N, Ferrone S: HLA class I antigen defects in maxillary sinus suquamous cell carcinoma: potential prognostic significance. International Congress Series (IFOS) 1240: 487-488, 2003. 16) Bandoh N, Ogino T, Hayashi T, Kishibe K, Takahara M, Imada M, Nonaka S, Harabuchi Y: Value of biological factors for prognosis in maxillary sinus squamous cell carcinoma: p53 gene mutations and apoptosis. International Congress Series (IFOS) 1240: 489-490, 2003. 17) Bandoh N, Chang CC, Cho HS, Wang XH, Ogino T, Harabuchi Y, Whiteside TL, Ferrone S: HLA class I antigen downregulation in human head and neck squamous cell carcinoma cell lines: Role of antigen processing machinery defects. Proc. Amer. Assoc. Cancer Res. (2nd ed. ), 770: 3868, 2003. 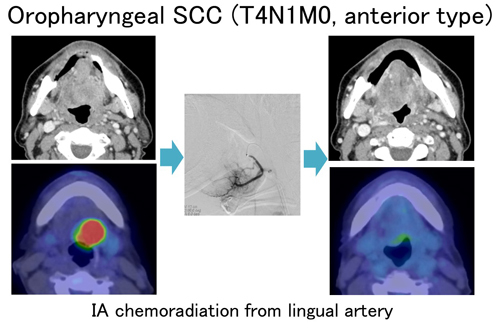 18) Ogino T, Bandoh N, Hayashi T, Miyokawa N, Harabuchi Y, Ferrone S: Association of tapasin and HLA class I antigen down-regulation in primary maxillary sinus squamous cell carcinoma lesions with reduced survival of patients. Clin Cancer Res, 9: 4043-4051, 2003. 19) Bandoh N, Hayashi T, Kishibe K, Takahara M, Imada M, Nonaka S, Harabuchi Y: Prognostic value of p53 mutations, bax, and spontaneous apoptosis in maxillary sinus squamous cell carcinoma. Cancer, 94: 1968-1980, 2002. 1. Bandoh N： Screening, diagnosis and treatment for thyroid carcinoma at Hokuto hospital, 3rd Japan-Russia International conference, June 4, 2016, Obihiro, Japan.